Sometimes you need a friendly group activity to keep you motivated and energized. 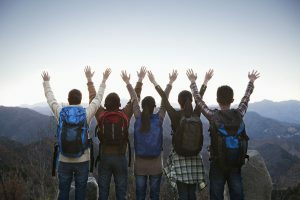 If you’re not an avid hiker or you prefer to be around others more often than not, then group hiking might be your best option for a great bit of exercise and quick pick-me-up that will last days. The energy you accumulate from this kind of activity endures for a while. If you do decide to stick with a group, however, there are a few things you should keep in mind while you’re out on the trail. First and most importantly, be sure to pace yourself to the slowest person in your group. Don’t show any aggravation, and try to be patient. If you’re the slowest member of the party, don’t let your speed worry you too much. Even though everyone will have their own natural rhythm, it’s important to hike together as a group if you start as a group. Splitting up increases the chance that a person or pair get lost, and that can create big problems later on especially if someone slips, falls or trips and suffers a head injury. On the other hand, if your group starts out too big–more than ten people is a good indicator–then try splitting down the middle. Try not to start at the same time, or you’ll still spend most of the day trying to keep up with the other group. It’s not a competition. Second, know where to go and how far you want to travel beforehand. You don’t need to follow your plan to the letter, but making one will help you get a general idea of what different people want out of the hike and what everyone thinks they can handle individually. If one person is only interested in walking a mile-long path while another desires a 22-mile vertical rock climb up the tallest mountain in the land, then perhaps it’s time for these plans to diverge. If you’re planning a longer hike with a bigger number of people, then try designating a leader and a sweeper. Your leader should be a fit hiker who knows the lay of the land; someone who is comfortable setting the pace for others to follow while paying attention to the needs of the people behind. Is it time for a rest? He or she needs to be comfortable providing that guidance when others can’t or won’t speak up. The sweeper is the person who trails behind the group to make sure no one ventures off on their own because they couldn’t keep up the place. This person also needs to be fit in order to keep up even in the worst of circumstances. When in a group, it’s important to decide when and where you’ll want to stop ahead of time. Even though you might take a number of short breathers in between these stops, it’s good for other members of the group to know where you intend to be during each portion of the hike. It’s smart to hand out maps and place markers where trails intersect, or where there are sources of water present. These are the best places to break. No matter what, it’s everyone’s responsibility to keep everyone else safe. Don’t go off on your own or get fed up and leave others behind, take note of everyone else’s limitations in comparison with your own, and maintain patience with other hikers when you’re a part of their group. Whatever you do, do not go hiking in Phoenix.